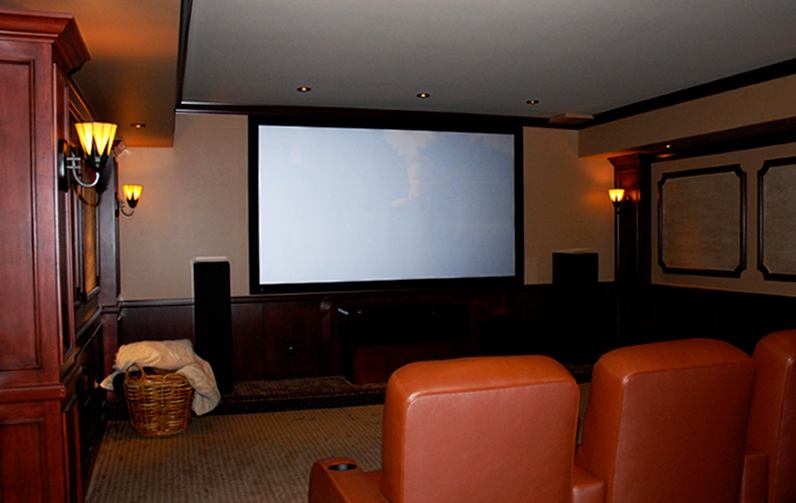 A custom home theater by Wasserson Design will change the way you watch TV, sporting events and movies. It's so much more than just a big screen, a bright picture and deep bass. It's an immersive experience that will transport you and your family right into the action! Beginning with a free design consultation, our experienced staff will analyze the layout of your room, listen to your goals and recommend a high-definition, custom home theater solution. And most importantly, we'll recommend a simple and intuitive control system to make your home theater system easy to use and enjoy. Then, our project team will install your system, fine tune the audio and video to precise industry specifications, and show you and your family how to use it. After the project is complete, we stand behind our work to ensure your complete satisfaction. Our experienced team can provide full room build-out and decor in addition to top-of-the-line audio/video equipment. Or we can work together with your decorator, architect or builder as a key member of your project team. No matter how we work with you, we'll ensure that the final result is a spectacular space within your home that you will be proud to share with family and friends.